How to Have the Best Lawn on the Block! Everyone, it seems, wants to have a nice green lawn. 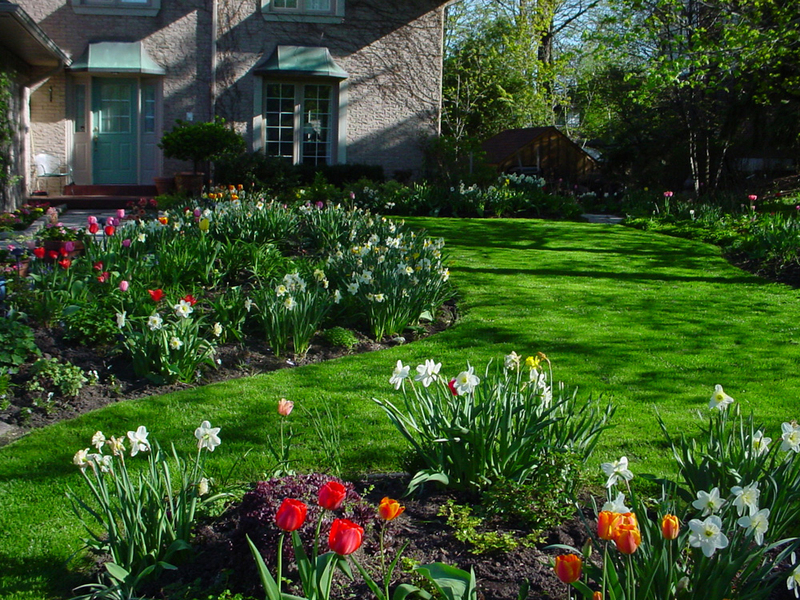 Even if you spend the rest of the gardening season on the golf course or at the cottage, I find that even the most negligent of lawn owners takes some time in early spring to spruce up the lawn, one way or the other. My job is to make sure that the time and money that you invest in your lawn - however little that may be - is well spent. Rake your lawn lightly with a fan rake - the goal is to get the grass blades to stand upright and to remove the winter debris. Aerate if necessary. I only aerate my lawn where foot traffic occurs as this is where the soil is compacted and most in need of the fresh air that you introduce when aerating. Use a power plug aerator if you are doing your whole lawn or buy an inexpensive manual 'foot' plug aerator at the hardware store for small areas. Overseed where your lawn is thin and where weeds are a problem. Use a good quality grass seed (I recommend Golfgreen: quality seed, 99.9% weed free and produced in Canada) and remember that the ultimate pedigree of your lawn is in the bag! Lay down 2 to 3 cm of triple mix (equal parts top soil, peat moss and compost) or Lawn Soil. Rake smooth. Spread the grass seed thinly at one pound for 400 sq. ft (1/2 kg per 40 sq. metres). Rake THAT smooth. Water. You will thicken your lawn nicely and compete most weeds out of existence -before they even get a start! Fertilize. Use a good quality fertilizer that is relatively high in nitrogen (about 20 to 28%) which is represented by the first # in the 3 number analysis. And make sure that it contains a 'slow release' nitrogen ingredient. This produces a greener lawn over a long period (8 to 10 weeks) AND feeds the lawn with the one element that it craves the most - nitrogen. The new Golfgreen Iron plus contains a slow release nitrogen formula for a greener lawn, longer. And with 10 times the amount of iron of the previous formula, the greening effect on your lawn is extraordinarily fast. Cut 2 1/2 to 3 inches high. Often we cut our lawns much too short. Remember this: the taller the grass blades the longer the roots. The longer the roots the greater the resistance to drought, disease and insect problems. AND most lawn weeds are 'shaded out' by long grass. Mulch. 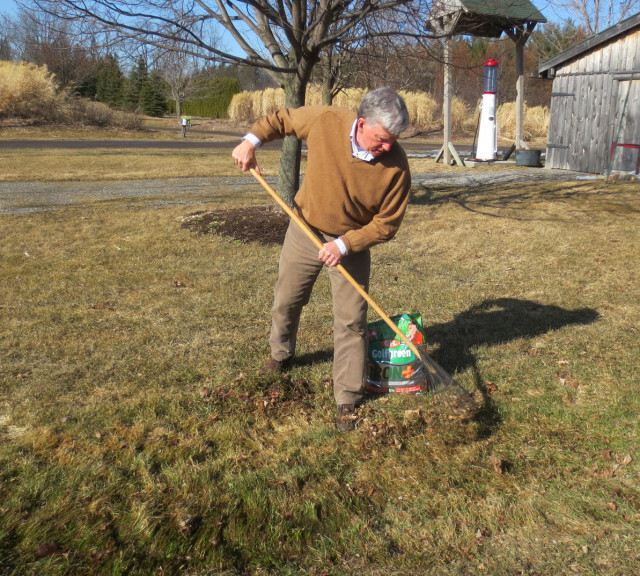 Use a mulching mower and return the nitrogen-rich grass clippings to the root zone of your lawn. Replace your old mower. You have heard that gas driven lawn mowers are big emissions spewers... right? Well, the new lawn mowers on the market are much 'cleaner' burning than the old ones. Look for MTD or Honda for two of the cleanest burning brands. And avoid the 2 cycle mowers that require you to mix oil with the gas. Just following a few of the guidelines above will improve on the environmental impact that your lawn has on your neighbourhood. And you will produce a lawn that you will be proud of.